1) What was to become the Marvel Super Heroes game was originally a homebrew super hero game I ran in college as a break between D&D campaigns. At that time I called it Project Marvel Comics. It was set in the Marvel Universe (a smaller place back then in the late 70s, when there was one X-men book and it had until recently been bi-monthly), in West Lafayette, Indiana, home of Purdue University, my alma mater. 2) The heroes were all members of the Junior Achievement branch of the Avengers (this was before the West Coast Avengers or others of that ilk). They were all original heroes, with guest stars from the Marvel Universe. The group of heroes (both in campaigns at Purdue and later in Pittsburgh) included such luminaries as Big Man on Campus, The Crimson Ram, Carl the Firebreather, and Super-Pin, the pro-bowler of steel. It was a pretty light-hearted game that involved destruction of large chunks of the wherever we were playing. Eventually the heroes got to visit New York City, where they met Spider-Man and fought Mayor Koch. I originally intended that to work out the other way around, but that was the nature of the campaign. 3) Soon after I joined TSR in Lake Geneva, all the designers were asked for "Blue Sky" projects - what they would do given their druthers. I did not suggest PMC first. Instead I suggested a very dark cyberpunk campaign (this would be, 1982 or so). Very dark and bleak. So bleak that it ate a hole through the bottom of the file cabinet. The management came back and asked what my second choice was. At this point I suggested Marvel Super Heroes. 4) The two dominant Super-Hero games at that time were Villains and Vigilantes, which was relatively light and popular in the East Coast and Midwest, and Champions, with was number-crunchy and popular in the West. I liked both games - V&V had my favorite power - Mollusk Control. Champions was very much about fine-tuning your character and was the first RPG I encountered that encouraged serious min/maxing of the characters. 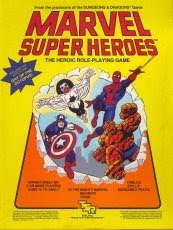 5) About that time, Mayfair games announced they had the license to do an RPG for Marvel. TSR double-checked and found that they did not have the license. TSR then got the license with Marvel. Mayfair soon afterwards got the license for DC. When their game came out, I gave it a nice review in DRAGON magazine. Mayfair used part of that review in its marketing. I was asked TSR's management not to write any more reviews. 6) FASERIP was the listing of the stats of the game - Fighting, Agility, Strength, Endurance, Reason, Intelligence, and Psyche. In the original PMC it was FASECMT - Fatigue, Agility, Strength, Endurance, Cosmic, Magic, and Technology. We also had FEATs - Functions of Exception Ability or Talents. Very Marvel Universe. 7) Karma, a spendable experience point that could be used to increase abilities or modify die rolls, was a descendant of the Hero Points from the earlier Top Secret game, but more granular. 8) The original PMC was more number-crunchy in its first incarnation. We quickly moved to what would become the Universal Table, a color-coded chart that was the one-stop shop for task and combat resolution. It is a descendant of the old Combat Result Table from Avalon Hill and SPI wargames. 9) Once I started working on the game for TSR, I think I went through about five different version of the Universal Table during the design at TSR before ending up with the one you see in the game. I would lay one out on Monday, Zeb Cook would shoot holes in it Tuesday, and I would try again Wednesday. I think it was five versions - it only feels like a dozen. 10) Original credits for MSH (later called Basic Marvel or the Yellow Box) were Jeff Grubb and Steve Winter. I did the mechanics and very rough draft, and Steve turned it into the Marvel style text. I think he did a great job at it, and that's why we're co-creators on the original, a veritable Claremont and Byrne. 11) We playtested the rules in-house with other designers. They also playtested it with kids, about 9 or 10. They videotaped the playtest, and made me watch it. I think they had to tie me into the chair. It was very illuminating about how kids used the game, but I really hope someone burned that tape. 12) It took longer to work out the licensing deal than it did to design the game. In the end, we were at the printer, ready to run, waiting for the final language for the legal statement. 13) The game was almost called "Marvel Comic Book Heroes". Our marketing department changed it because that was what people thought of when they thought of Marvel - comic books. I protested and was told that they didn't want "everybody and the janitor" getting involved in the marketing process. I ended up in a couple comic book shops in the Wisconsin and Illinois area with a questionnaire to disprove their point. 14) I would take liberties with the legal indicia (the mouse-print in the front of the book) on future projects. I think I used the phrase "Mess with Hulk's Lawyers, and Hulk will smash!" and that one got through, and soon afterwards I stopped writing the legal indica. 15) The original game got a mixed critical response. The reviews of the time were of the type of "Well, its OK if you like that sort of thing" or "It's a little basic" (well, yes. Yes it was). Champions did a very nice job holding down the very-complex end of the spectrum, and this one was going to be easier to run and play. One review dinged us for our "Face-front, True Believer" tone. A few years later, when we did the more hobby-market Advanced set (the Blue Box), the same reviewer complained that he missed the "Face front, True Believer" tone of the original. 16) The contract called for a dozen products from TSR in the first year. We were unsure if that meant a calender year or a full year from the first product. That was one reason we had so many early products, 16-32 pages in length. We had the advantage that we had the entire Marvel Universe to play with. 17) We were also an early pioneer for full-color maps in the gaming product, since the game used area movement. The city maps could be eventually fitted together into a larger city. It was kinda New York, but I made the mistake of making the numbered streets East-West instead of North-south. The businesses were all named after other people in the company, until someone in management found out that didn't like the idea and we stopped. 18) I was incredibly excited when we got John Byrne to do a cover for us - Murderworld. On the back of his original art were some sketches re-drawing the TSR logo. 19) Working with Marvel was great. In those days, all the art was in a warehouse "across the river". To get pick-up art, I could ask by issue and page number, and they would send out the stats. It was very easy, and the process made it possible for us to do a lot of things very quickly. 20) Another Murderworld story - Someone at Marvel's legal department asked us to put all the trademarked names in ALL CAPS. We pointed out this was a bad idea but they insisted, which is why the names in Murderworld are in ALL CAPS. After they saw the product in print, they changed their minds and we went back to the original presentation. 21) Marvel owned all the characters, of course. I created one character, Cascade, for an Alpha Flight adventure. They never picked him up. Pity. 22) When we did the Basic MSH, Marvel didn't want us to put in any character generation - they wanted people to play Marvel character (which makes sense). We put in a rudimentary system in the back. When it came time to do the Advanced Set, Marvel sent the note "Whatever you do, be sure to put in a character generation system. That's what fans really want to see." I'm not bashing on Marvel here - they were learning like we were learning. 23) MSH did a wonderful job opening the doors of the comic book shops to RPGs. It arrived at a great time, when local direct-sale shops were blossoming, and looking for ways to expand. I'm sure a lot of them would have picked up D&D on their own, but it provided a nice bridge. 24) The first time we showed up as a company at the Chicago Comics Con (then in a hotel in Rosemont), we had a table in the hallway outside the main dealer's hall, and were armed with a map, a tripod with a picture of the cover on it, and some metal miniatures. We gave away a lot of Wolverine miniatures at Comics Con to people who would play our demo, and to this day people tell me they got a miniature from me. 25) The Ultimate Powers Book came about because one of our editor's boyfriends was in the office, making a list of every superpower he could think of. One of the managers found out about this and thought it was a great idea, and that was how the UPB came about. That sort of thing happened more often than you would think. 26) Similarly, the Official Gaming Handbooks came about from the same sort of inspiration - A manager reasoned that Marvel must have computer files of all the text from the original Official Handbooks of the Marvel Universe (OHOTMU), so all we have to do is add the game stats. Unfortunately, Marvel DIDN'T have all the text in a computer file, and we had to input it all in. In-house, we referred to the large books as "The Phone Books" since they were the size and shape of the Lake Geneva White Pages. 27) Early on, we had a knack for publishing things that were immediately outdated in comic book continuity. We would publish a map of the Baxter Building and they would blow it up. We would do an Alpha Flight adventure and they would change the line-up dramatically. Peter David once suggested we do a New Universe adventure so they could wipe out the line (they did, eventually, without my help). 1) I love your game! 2) I love your game, and here's how to fix it! 3) I play Champions, but I buy all your stuff to convert it over! 29) Eventually, I drifted off to other projects, and the responsibility for running the line moved to Steven Schend, who did a great job through the phone books and later projects. He was also our next door neighbor in Lake Geneva. Thanks, Steve! 30) We ran the Marvel-Phile articles in Dragon magazine for what seems like forever - so much so that I became a "Contributing Editor" on the masthead. The main purpose for the articles were to cover characters that changed suddenly, or character that would never show up in a regular product (say, Howard the Duck). We even did ROM, Spaceknight, which resulted in Marvel and Hasbro getting together to figure out who actually owned the character. Finally, my best Marvel games were always ones were people brought their own heroes into the world of Marvel Comics, mixing their own stories with the "established continuity". It was a blast, and I really enjoyed it, and it feels very good to know that the game still has a warm spot in a lot of gamers' hearts. OK, enough being old school and nostalgic.